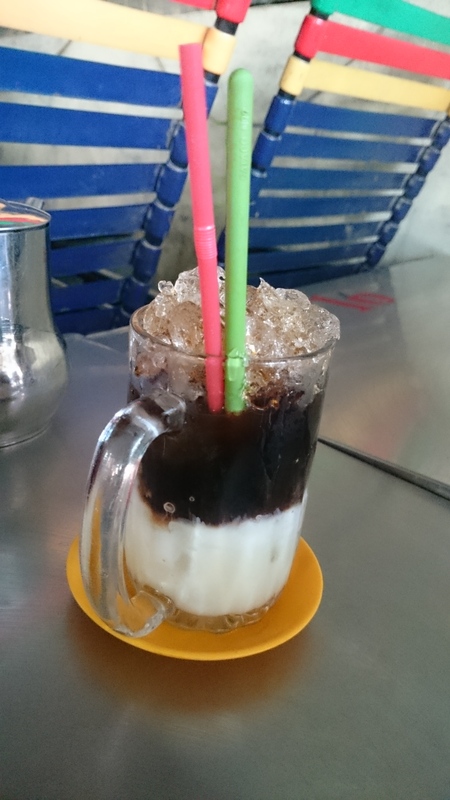 Making a Difference at Angkor Borei – Travels. Food. Sights. More. but never really saw through with it. There was always something more important, some location more “worth” visiting or just simply the lack of that little nudge to actually get down to actually volunteering. After a few hours of deliberation and intensive research, I then decided on venturing to the ASEAN International School in Angkor Borei. 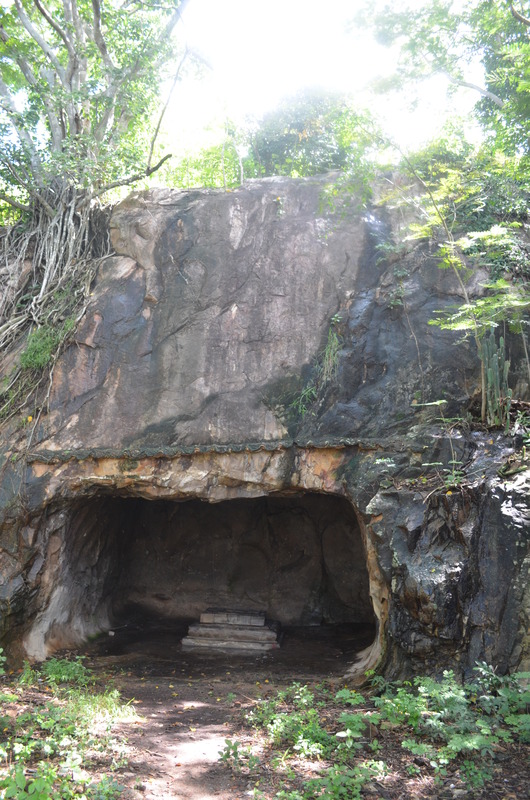 is located in Angkor Borei, about 85km south of Phnom Penh, the capital of Cambodia. The school’s director is Mr Sophea Koy, who with the help of another 2 full time teachers and has to run 3 sessions of classes a day from Monday-Friday. Most of the students in the school are from the village within the vicinity and range from 4-17 years. However, during one of the night classes I taught, there was an adult who was working as a police officer who was 42 years old! 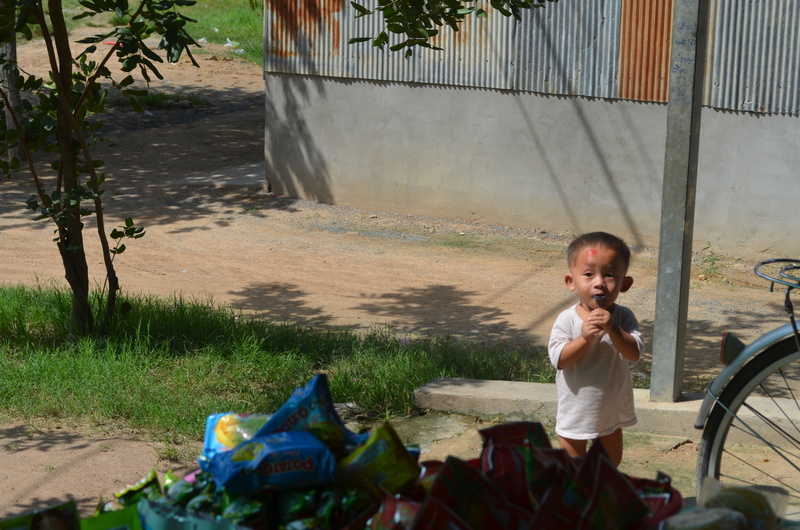 The villagers in the area are thrown into a life of poverty since birth. Despite of the lack of comfort such as warm water for showers or a basic bed that so many of us are used to, they learn to enjoy the simple things in life and are content with what they have. Perhaps ignorance is bliss to them, but still it came us a reminder to me to really appreciate what I have and that happiness is really, a state of mind. The students know the importance of English as a means of getting them out of the vicious poverty cycle and are earnest learners. They really give their full attention to any volunteer teachers who can impart any knowledge to them. The school is really shorthanded and any help at all, whether it is one or two days to a few months would be deeply appreciated. 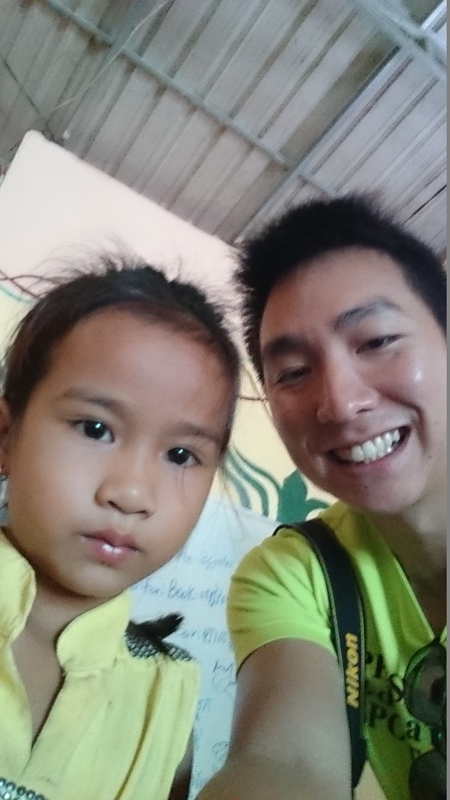 The kids also brighten up to a new foreigner in their midst – I was the only foreigner in the whole village when I visited! I invested in a sim card as at the airport as some form of safety (Yes, Google maps work here) in case I got lost. It only costs 3USD for 3GB of data, buy it at the airport exit where you can find English speaking vendors. The minivan driver, I discovered later, is friends with the School Director and will drop you off at the school when you arrive in the village. The blue door is the entrance to the bedroom of volunteers, on the far left of the picture is the volunteers’ toilet. There is a western style toilet with a shower, but there is no warm water and LOTS of mosquitos. What I did was to smoke out the toilet with a mosquito coil 30 min before I went to shower. This was really effective in getting rid of the mosquitos! My humble raised wooden stilts bed. A mosquito net hangs above,but it has holes in it, so if mosquitos get in(which they did) they would be enjoying a nice buffet. There are lights, a ceiling fan and a 2 pin power socket in the room. There is also WIFI available in the school area. This fried chicken was cooked for dinner on the day I departed, really yummy! There are 3 main classrooms on the school premises and it is fully paid for by the school director, Mr Sophea Koy. The classrooms are equipped with basic tables and chairs that are evidently weathered. Teachers teach using primarily a whiteboard. There are 3 sessions a day in the morning, afternoon and evening(for older students). The school’s director Mr Sophea has to singlehandedly fetch the young ones to and from school after each session, sometimes making trips twice per session as the school is only equipped with one minivan. Mr Sophea after fetching the kids to school for the afternoon session. These kids stay in varying distances from the school, up to 30min away. They learn to be independent at a young age The girl in the foreground with the earrings was in charge of opening and closing the van doors after each student was dropped off after school. She struggled with the strength to open the door each time but always persisted and managed to. This really made me reflect on the sheltered life that kids in Singapore enjoy. This is the real deal – 5 stones played with 5 actual stones they picked up on the floor. Such traditional games are how these kids spend their 15min break. This adorable little one went early to class and was climbing from table to table. Every Friday, the teachers screen English shows on Youtube with the only projector and laptop the school has. Some kids are so amused with even the shadows formed from the projector and were playing with it. Marbles, another traditional game the students played. The school had an interesting concept of allowing students to go out anytime to buy snacks to eat during class. A snack costed about 500 Riel. One interesting thing I observed was that the kids littered the floor after they consumed their goodies, and the teacher would just sweep up all the trash after each lesson. 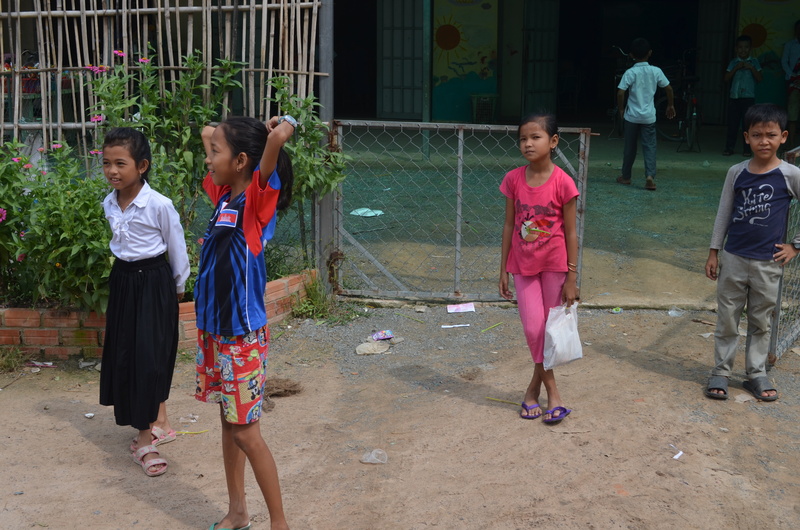 The “playground” area for these kids was the patch of rocky/sandy ground outside the classrooms. The simple sheltered structure in the picture served as their slide,swing and whatever they could think of. 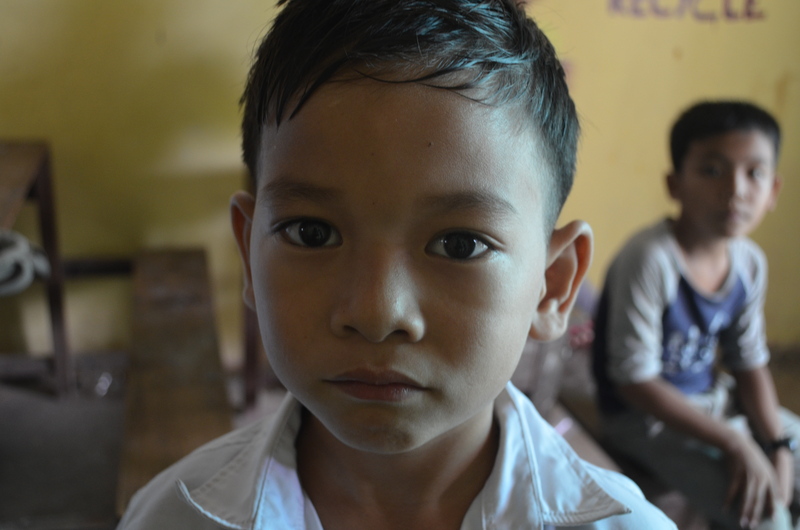 Hygiene is really not seen as important for these Cambodians kids. One minute they are playing 5 stones with stones they picked up from the muddy ground, the next they are licking chocolate off their fingers. 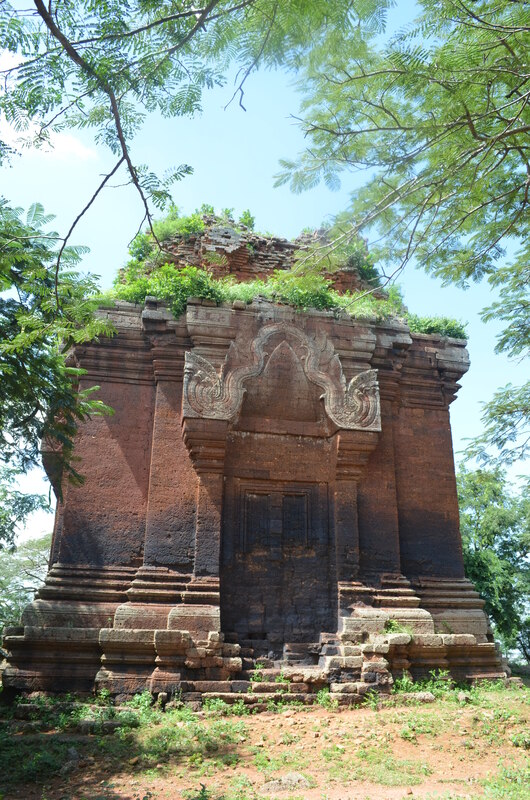 Situated about 30min from the school, this was a temple that was built earlier than the Angkor Wat! 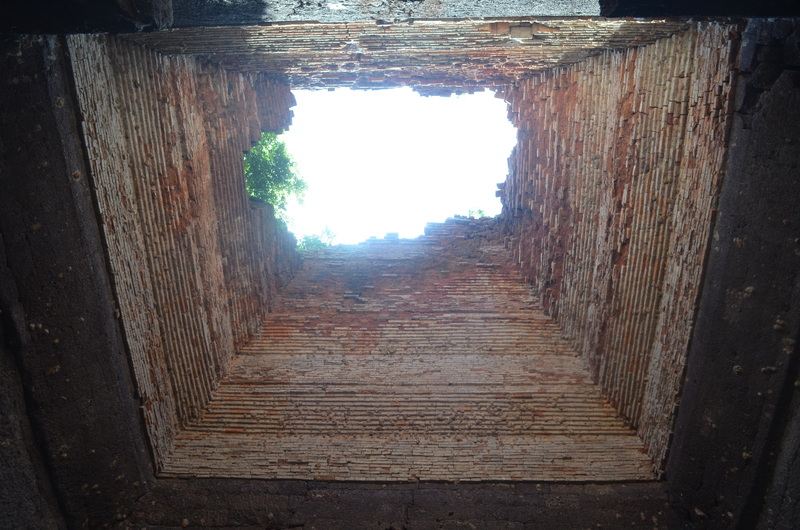 However, it can be seen that the top of the building is missing – it was damaged during the Khmer Rouge era by the US bombings. Nevertheless, it is still a sight to marvel at how their early ancestors were able to build such a magnificent structure a millenia ago. View from atop the temple. overseeing the massive padi fields. 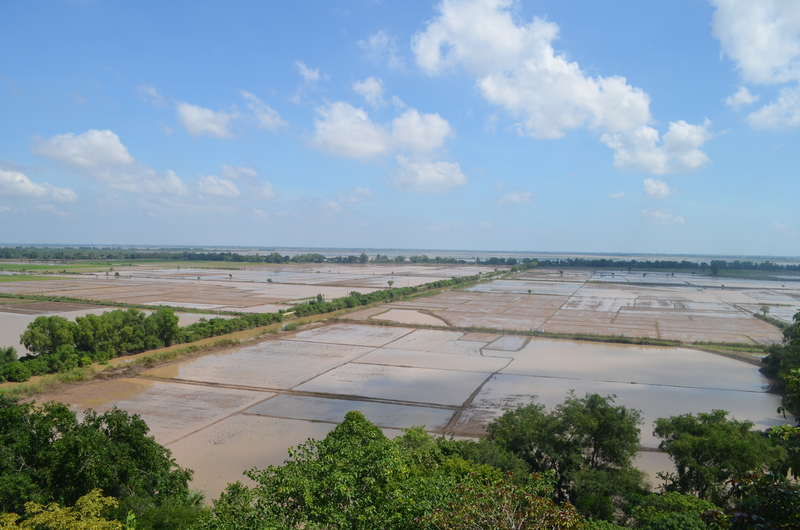 Rice is the main crop grown for the people in the area. In the distance lies the border of Vietnam, separated by the Mekong River. 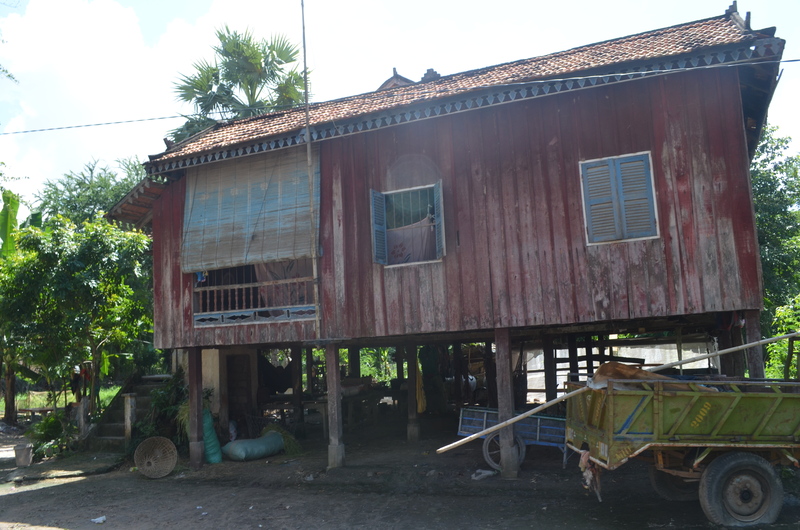 Angkor Borei is a small area, where there isn’t the usual multitude of tourist attractions to visit. 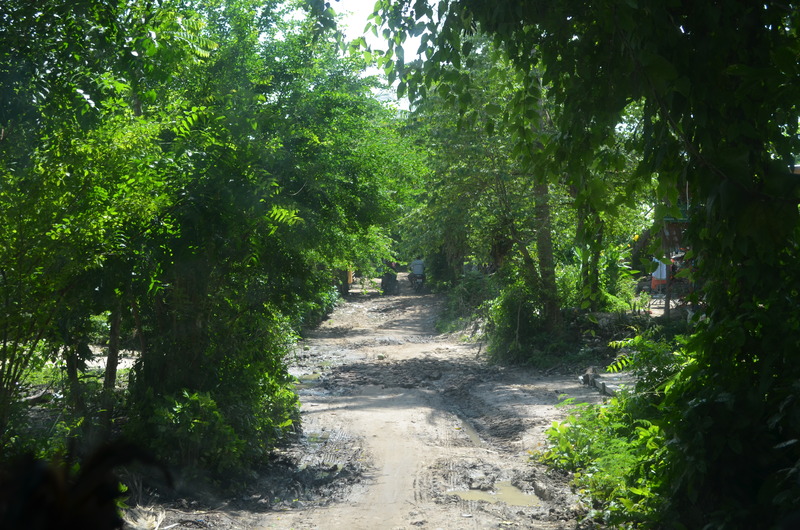 However, it truly is an experience to stay in such a undeveloped area to get a first hand taste of how it is like to live in an environment where everything is moving at a slower pace. Being able to observe how life is going on for these sturdy people in such a harsh environment is truly a humbling experience. 5 min walk away from the school lies Sony Cafe, that is lined with deck chairs. 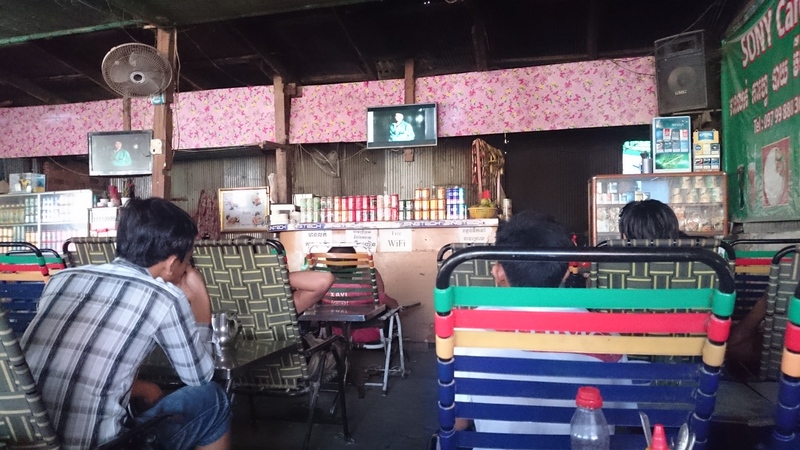 Villagers go there to watch dubbed version of various movies that is played back to back daily. A drink and a meal there costs only 2-3 USD, definitely a good place to chill whilst having a break! Volunteering at the school, though for a short period of time was a really meaningful experience for me and really opened up my perspectives on life. The kids really brighten up when they see foreigners coming down to teach them, and it may be their only chance of any interactions with foreigners from outside their little town. With 3 sessions a day, and only 3 permanent teachers, the school is always open to anyone who is willing to volunteer to teach English, or just to mingle with the students. Whether it is just a few days or a few months, any help would be greatly appreciated! Students from more modest backgrounds in the school do not pay any school fees and the other students pay 50USD a year for school supplies and the teacher – Which is barely enough to pay the teachers and to buy study material for all the students. Drop me an email at timothycwe@hotmail.com or visit their website at http://www.aseanschool.info/index.html for more information! 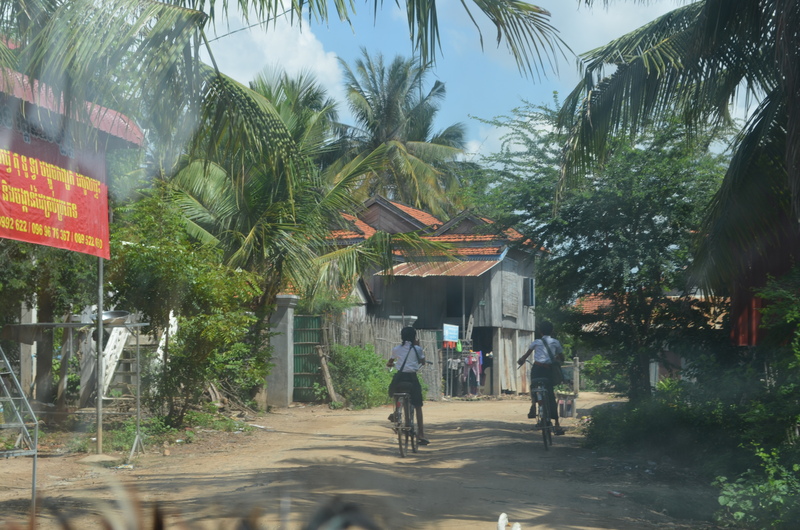 Most Cambodians do not speak much English, only the Tuk Tuk drivers and perhaps some of the older students do. The official currency is the Cambodian Riel. However, they also accept USD as well. (1USD=4000Riel). It is the only country I’ve been to that returns me change in 2 different currencies. The smallest USD denomination they work with is 1USD, any part of that they would return you accordingly in Riel. 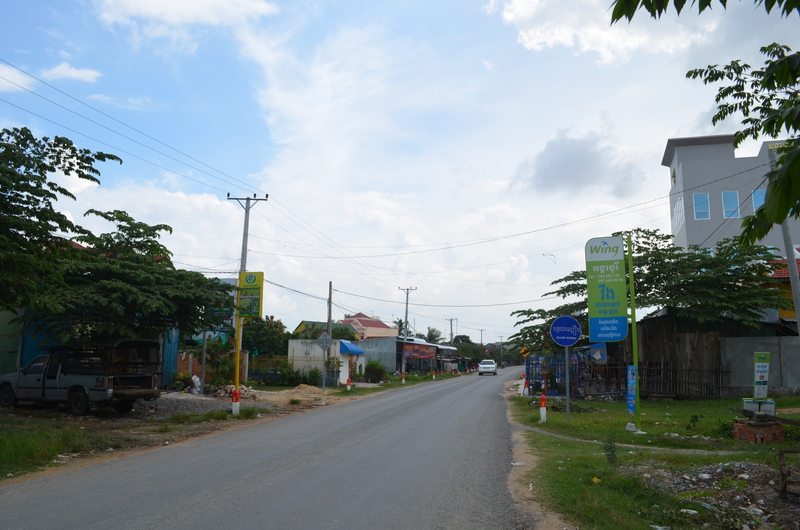 Typically motorbike rides cost between 1-3USD(for 1 pax) and a tuk tuk ride will cost between 2-5USD(up to 4 pax). Taxis are available as well, but I did not get to use it. Motorbikes would get you around faster as they can squeeze through traffic.